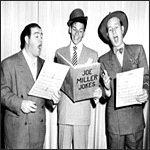 Bud Abbott and Lou Costello preserved the rich oral traditions of vaudeville and burlesque...and became two of radio's biggest stars in the process. The sarcasm of Abbott's stern straight man is the perfect comedic compliment to the muffled screams of Costello's blustery "baaaad boy." The legendary timing and chemistry of these sensational comedy sketches elevated one good natured goof and his patient pal to enduring symbols of silliness. Each week 20 million listeners tuned in to hear Bud and Lou's verbal antics. The duo's radio popularity paved the way for their success as cinema's top box-office team of the 1940's. Relive the Golden Age of Radio and enjoy the power of patter in these perfect performances. (5/22/1947) WILL MARILYN MAXWELL MARRY COSTELLO? (11/4/1948) SAM SHOVEL IN "THE CASE OF THE GROCER WHO FELL IN WET CEMENT"
(11/11/1948) SAM SHOVEL IN "SORRY, WRONG RUMBA"
(12/16/1948) SAM SHOVEL IN "IT WAS TIME FOR A CHANGE"
(1/13/1949) SAM SHOVEL IN "SHE RUBBED HIM OUT"